Dimensions: 10 1/2 x 17 5/8 in. Typical pencil annotations on impressions from the edition: numbered and titled, l.l. ; signed and dated, l.r. Title and impressions outside the edition: The NYPL and BPL impressions bear the slightly variant title "Entrance to the Village" (l.l.). The NYPL impression is annotated "First Proof Second State" (l.l.). 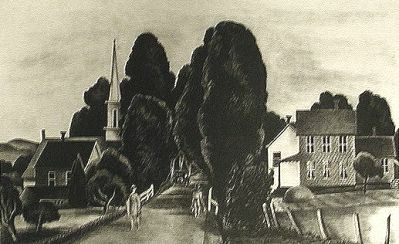 The WAA impression is titled, "Woodstock Road" (l.l.). *Setting: The village referred to in the title is Woodstock, NY. Fiene was living and working part of the year in New York City and part in Woodstock in 1927 when this work was executed. One impression outside the edition has the variant title, "Woodstock Road" (as cited just above). Dedication: No.1/50 of this edition is inscribed as follows: "This edition is dedicated to Mrs. Juliana R. Force --" Juliana R. Force was the first director of New York's Whitney Museum of American Art, which was founded in 1929. In 1927, the year of this print, Force was director of the Whitney Studio Club, a precursor of the museum, located first on West 4th Street and then at 10 West 8th Street in Greenwich Village. The purpose of the Club was to provide exhibition space for works by young artists as well as to be a gathering place for them. Fiene participated in at least two of its exhibitions. The impression dedicated to Mrs. Force bears a stamp (probably a collector's stamp or a printer's chop mark on the reverse. Paper: Impressions on both BFK RIVES watermarked wove paper and Japan paper (with a chrysanthemum watermark) have been observed. [Landscape with Village], 1925, Oil on Canvas, 18 in. x 28 in. The two works illustrated above demonstrate Fiene's propensity for the subject of a road entering a village, the frist having obviously the same setting as the lithograph. References to other works (not shown here) with titles similar to (and from the same period as) catalogue entry # 24 include an "oil" entitled "Entrance to the Village No. 2" shown at the Whitney Studio Club auction on March 10, 1927 and a work listed in the Kraushaar catalogue "Exhibition of Paintings Drawings, Lithographs and Water Colors By Ernest Fiene" dated Nov. 12-26, 1927. 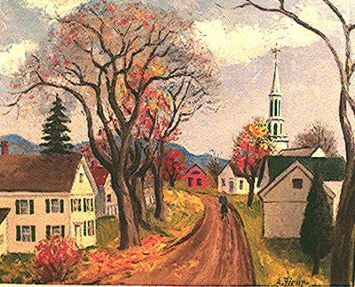 There is another work in the same catalogue entitled "Road to the Village." The catalogue does not specify the medium of either work, and neither is illustrated in the catalogue. 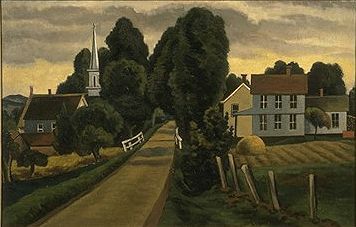 The Newark [NJ] Museum of Art owns an o/c titled "Entrance to a Village" (c. 1927).